Here’s the thing about Meatloaf – with the exception of a “loaf” of bread, I don’t much like food with the name “loaf” in it. I am completely okay with you thinking I’m weird. But seriously … liver loaf, salmon loaf … gross. Just the word “meatloaf” makes me cringe. Just the word “loaf” alone is a good enough reason in my opinion not to eat something! When Nathan and I first started dating and he mentioned making meatloaf for dinner, I scrunched my nose up and said, “I’m not crazy about anything with the word loaf in it.” He promptly declared me insane and set about making meatloaf. I requested he leave off the cooked gelatinous ketchup product on top and he obliged. I loved it! Over the course of our dating life, and now married life, I’ve grown to love our meatloaf recipe. I am even okay with a red sauce being added to the top these days. But please don’t go thinking that I’m normal. Nope. I still have a hard and fast rule … I do not ever, ever eat meatloaf at a restaurant under any circumstance. If you invite me to dinner and you make meatloaf, just know that I may not be able to eat it. It all depends on my mood. My relationship with meatloaf is still shaky. However, I know exactly where my relationship stands with liver loaf and salmon loaf. It’s non-existent. It never happened. No way. Not in this lifetime. Nathan just rolled his eyes. Poor guy. Do you have any weird hang-ups about food? Saute onion and bell pepper in 1 tablespoon of olive oil just until tender. Mix all ingredients together by hand. Grease a 9X13 baking dish and spread mixture evening in the dish. Bake for 60 minutes or until no longer pink in the center and the outside is crunchy. If you want to add ketchup, BBQ sauce or red chili sauce, just add it for the last 20 minutes of cooking. We always serve our meatloaf with Paula Deen’s Turnip Mashed Potatoes. They are yummy! MMMM…….that sounds delish! I’ve always been a fan of meatloaf myself! As far as food hang-ups go, I’ve always avoided liver and onions. Never tried it, just sounds BAD! yeah… liver and onions…. hell no. The Pioneer Woman’s Meatloaf recipe is amazing!!! I think the part that makes it so good is she wraps it in bacon before cooking it. YUMMY!!!! i agree – as yummy as i think meatloaf is, i cringe when i say or hear the word out loud! and i’m with y’all on the liver and onions. eww. I don’t cook…much….So my only option for meatloaf IS indeed a restaurant. Logan’s has a good ‘un (it’s not a ketchup-type recipe)..and I will admit to you that I do like the meatloaf from Golden Corral. I will not, however, eat the brussel sprouts from there. If I get to go to Golden Corral, I ain’t eatin’ no vegetables. ‘Cept potatoes….The only vegetable that makes it into the “junk food” category. 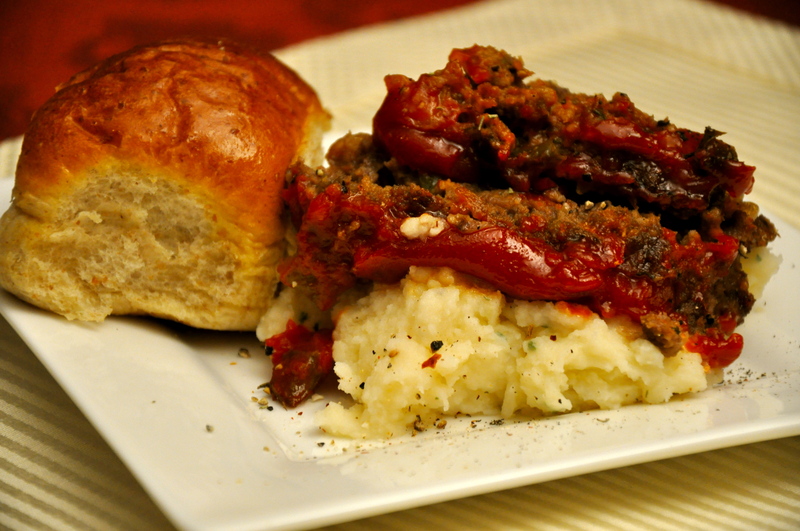 I <3 anything that goes with potatoes…Like…Meatloaf. Haha this is too funny. I googled meatloaf need a new name and found your post. I love my meatloaf but I hate the name! I have lots of food hang ups. the first 1 that comes to mind is grapes. I can’t eat any of the grapes that fall off the stems into the bag.